Every human being has a unique personality, mindset and totally different characteristics altogether. There are so many factors that determine the character of person right from the genes to the way they have been brought up by their parents as well surroundings. An extrovert personality is someone who loves to be among a group of people, never shy’s away from the crowd and almost very good at socializing. Whereas, introvert persons are someone who loves to be in their own space and always tries to hide their introvert personality or presence everywhere they go. When it comes to career planning there are many jobs available all over the world according to the type of the person they are all together. This post is all about the various job options for introverts and extroverts that are available according to their behavior. Irrespective of the skill set, every individual whether introvert or extrovert have their own behavior which has to be respected and considered even while taking up a job. 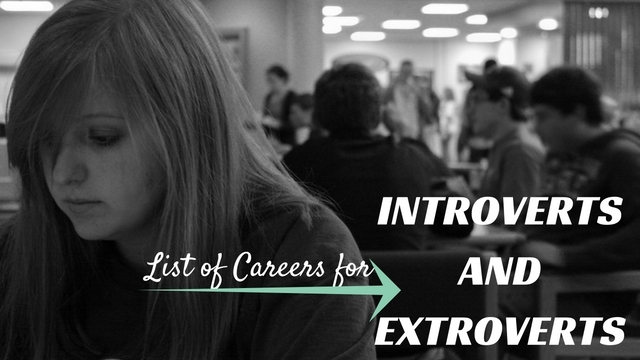 Here is the list of career options or available best jobs for introverts and extroverts. Lawyer is the most commonly referred job for an extroverted personality. There is always a misconception that a lawyer is someone who acts as a spokesperson on our behalf in the court and has to do a lot of inside the court. But the lawyer is someone who meets various issues of the society and handles different occasions at an ease. It involves lot of understanding with the people’s expectations, good communication skills and many social contacts. Hence, extrovert persons can choose lawyer as a best career option. There are so many products which gets launched every day. But the real success of a product is how well it has been reached in the market. This is done by marketing team of the organization who are always expected on the move, and be in good terms with the customer centers and public relations. Sorting out the attributes of marketing field, extroverted persons can choose this as it is a good option. Event management is one of the most active social job which requires highly energetic people with good social contacts in the society. Managing an event requires leadership quality, better understanding of the expectations and of more field work than sticking to desk. Hence, this job role is very apt for extroverted persons. Administration jobs are made for extroverted people. This job is all about dealing with so many new faces every day, as well as connecting the various departments of the organization. An extroverted person perfectly fits into this job role as they know how to handle strangers as well as keep them occupied. There are so many jobs in the administration department which need people who know how to socialize as well take quick decisions. Hence, administration job role is most suitable for extroverted persons. Even though this role does not have anything directly associated with being extroverted, it has lot many qualities that are been possessed by an extrovert. A police officer job role involves handling various types of people every day. Good decision making skills, better understanding of the circumstances add to the characteristics which are the attributes of a police officer. Running an own business is something which is meant for an extroverted person. Leading a company, looking after the needs of the employees, meeting the clients to build new projects requires more of a person who can get along with people at any given occasion. Maintaining a relationship, attending social meetings, taking quick decisions is also a most important aspect of running a business. These key skills are the basic qualities of an extroverted person. Hence, becoming an entrepreneur is a good career option for an extroverted person. As all of us are aware of the job role of a doctor, it is the most suitable job role for an extroverted person. Anyone would want to speak out his/her heart to a doctor without any kind of hesitation. Very good listening skills, better understanding of strangers, making them comfortable with space is the key skills of an extroverted person which is also the mandatory qualities of a doctor. Not only doctor, a nurse, a therapist or any kind of specialization in medicine will suit an extroverted person. Human resource department is one of the most stable and wanted job roles in the market. As the name suggests it is a job role where each person in the human resource department will work to hire new employees in all sectors. And also this human resource department will have to meet new job candidates every time and they also look after all needs of the organization regarding the employment. It is certainly an apt job role for an extroverted person as this job role is all meeting new people every day, have to take decisions, good listening skills and it also needs lot of socializing to find the right candidate. Any kind of business or a corporate needs a team of people who are good at hospitality. Being a part of hospitality requires lot more patience, ability to deal with all age groups, and also meet the needs raised by the people who visit the place. There is a lot of scope for an extroverted person in this job role as it assured that they would be able to meet and understand the needs of the stranger who visit the organization. Needless to say teacher job role is truly meant for an extrovert person. This job requires good communication skills, ability to connect with the students, and be one with them. As teachers are someone who handle the younger generation, they need to make the learning interesting. Not only working with children they should be able to build a good rapport with their parents to make the journey of education go better. Hence, this job role is well suited for an extrovert person who can be as someone among the group of children. Today most of the organizations have a special team to maintain their public relations. It is a must that organizations need to meet the criteria raised by the public and also about the public image of the organization. There are many graduation courses for public relations. This job role is most suitable for an extroverted person as they constantly need to be in touch with the public, know the pulse of the clients, as well as they, need to host many campaigns on behalf of the organization. This public relations job is not only for a private sector even ruling government also has a special team for public relations. A strong interpersonal skill, good relationships with the media is most needed to become a good public relations officer. Also, these are the key skills possessed by an extroverted personality. Social media domain necessarily does not need someone who is good in maintaining social contacts. This job is all about virtual reality where a person belonging to this department need to work online and there is no need of meeting new people and mostly they need to speak through telephones if necessary than getting exhausted meeting new faces. Hence, choosing social media as an option is good for introverted persons. As the name suggests, this career option is very artistic and involves a peaceful environment and gives a personal space for those who choose this as a career option. There are so many institutions which offer a degree for artists and also many courses related to artists. This is one of the best introvert jobs for an extroverted introvert type of person. This is another unique department which does not involve lot many social behaviors except meeting and getting the client details and technical issues. This job role is very independent and has an own space expected by the introverts. There are many jobs in the hospitals which remain unnoticed. One such is independent career or job is medical record lab assistant. This job is all about organizing lab records and documenting the old records. This job has least interaction as well as good promotions in future as most of the hospitals needs a record storing labs for future reference. It is a wrong notion that people in legal environment need to be very socially active and an extrovert. Paralegal or legal assistants are people who maintain legal records and collects data about the various issues before taking it to the lawyer. It is an interesting job role as it involves lot of research work and paper work. Hence, if you are an introverted nature and wish to be a part of legal department then being a legal assistant or a para legal is perfect for you. If you are a creative person and who loves to design, this job is apt as it does not involve any outside world interaction. All you need is a topic or subject to be designed and the graphic designer will have their own space. There are lot many graduation courses available as well as you can join technical courses to master the subject. There is always a choice of career from the way you look at it. Never think a lot or reduce your options considering the negatives of your personality. Choose a career which keeps you happy at all aspects and brings your real talent out. Hope this post gives you an idea about the various career choices available for both extroverted nature and introverted nature.